First things first: Baby Rhino Malindi likes to scamper and frolic at the Chester Zoo in the UK. Donald Trump tossed a fresh gallon of gasoline onto the embers smouldering in America's racial divide, criticizing black NFL Football Players for kneeling during the US National Anthem at pre-season games on Thursday night. "Find another way to protest, stand proudly for your national anthem or be suspended without pay," tweeted Trump, "Numerous players, from different teams, wanted to show their 'outrage' at something that most of them are unable to define." Three things wrong with it: Trump has no authority to order salary reductions; and players who refused to stand during The Star-Spangled Banner have been consistent and articulate that they are protesting were against police brutality of African Americans and racial inequality. The third thing wrong with Trump's unnecessary provocation is the backdrop: The anniversary of the Charlottesville, Virginia white supremacists riot is in a few days, and so-called alt-right groups were planning demonstrations in the college town and in Washington, DC. Police presence at both venues has been raised and tension fills the air. Many complain that Trump has attempted to normalize racism, and are still angered after he declared there were "good people" on "both sides" after a neo-nazi chunk of crap murdered a woman by ramming his car into a crowd of peaceful counter-protesters. Trump's attempt to worsen America's racial divide came the morning after a stunning loss in court: At a hearing over the fates of two El Salvadoran asylum seekers, the US Government informed the judge that the two were being deported as they spoke. The enraged judge, DC District Judge Emmet Sullivan, ordered the plane turned around and threatened to hold US Attorney General Jeff Sessions in contempt of court. Sullivan ruled the two must not be deported while their legal case is still pending, and the two were back in Texas before the end of the day Thursday. Ordinarily, that would have been the lead story on Friday morning. Trump and Turkish President Reccep Tayyip Erdogan are locked in an escalating fight that could have regional consequences. Two police officers were among the four people killed in a shooting in Fredericton, in the eastern Canadian province of New Brunswick. This isn't usually the sort of place that has mass shootings, but the US gun problem has been slowly leaking over the border and Canada is experiencing more violence. Police initially locked down the town while they sought the 48-year old shooter, who was apprehended and is hospitalized with serious injuries. An earlier mass shooting in Moncton, New Brunswick in 2014 saw the deaths of three Royal Canadian Mounted Police officers. Saudi Arabia is ignoring calls for an independent investigation into the attack on a civilian bus in Yemen that killed dozens of children, and says it will conduct its own probe. A missile fired by the Saudi-led, Western-backed coalition backing the Yemeni government in its civil war struck the bus, killing at least 51 people - 40 were children, and most were younger than ten years old. The Saudis claimed the bus was a legitimate target and claimed the rebels were using children as human shields. Three Italian climbers died in a snow and rock slide on Europe's highest peak Mont Blanc in the French Alps. The heatwave is causing more melting at high altitudes, making climbing more difficult. Fifteen people have died on Mont Blanc this season, compared with 14 in all of last year. Zimbabwe's presidential inauguration was scheduled for Sunday, but it is being delayed because of opposition leader Nelson Chamisa, who filed a Constitutional Court challenge to this month's election. Chamisa's MDC (Movement for Democratic Change) alleges that President Emmerson Mnangagwa's Zanu-PF rigged the election to achieve a slender victory in the country's first election since the ousting of Robert Mugabe. The United Nations General Assembly approved the appointment of former Chilean President Michelle Bachelet as the world body's new human rights chief. Bachelet is "a pioneer, a visionary, a woman of principle, and a great human rights leader for these troubled times," wrote Secretary-General Antonio Guterres. Ms. Bachelet is a physician and noted champion of human rights, and not one to back down from a fight. She will replace Jordanian diplomat Zeid Ra'ad al-Hussein, who will step down from the post at the end of the month after a four-year term. Japan's education ministry has launched an unprecedented investigation into medical school admissions after a Tokyo university admitted it deliberately and wrongfully reduced the test scores of female applicants to ensure there weren't too many female doctors. All 81 private and public medical schools are to check their admission procedures for possible discrimination against female applicants, and the ratio of male and female students. "People say female doctors tend to quit. That's total nonsense," said Mizuho Fukushima of the opposition Social Democratic Party, "We have to get angry and change this no matter what." A man in Karlsruhe, Germany had to call the police to help him with a relentless red-haired stalker who would not stop following him. 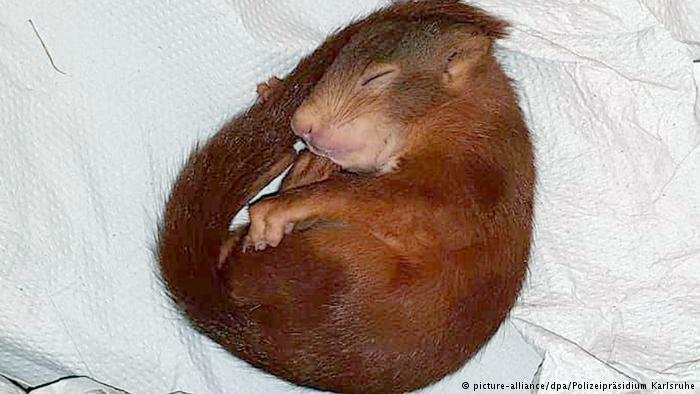 The problem resolved itself when the stalker, a baby red squirrel, fell asleep. Cops named him Karl-Friedrich and took him to a wildlife sanctuary. Apparently, baby red squirrels in Germany have been known to follow people around rather obsessively when they are hungry or otherwise in need of help.